I'm really enjoying your blog. I also have a fascination with trying new fruits. I have a youtube series where I review fruit ("weird fruit explorer" if you'd like to check it out) I hope you don't mind if I use your site as a resource, its very informative. Very cool to see another fruit fan! Your videos are super-helpful because I've often had a hard time describing the taste of little-known fruits (like nutmeg's aril, for instance). Thanks for these extra insights. nice blog and interesting since am having an orchard your blog helps me a lot. My custard apple trees are bearing fruit for the first time this year, how can I know the time to pick them? The recent drought in my part of Australia has saved a rotted wampee I was about to hack down. Not only has it recovered from rot but it is loaded with fruit for the first time in years. What a pleasure to then discover this entry on your blog about a fruit I thought I'd never taste again. Thank you, Catherine. Please keep blogging. Recently was in Jakarta, Indonesia & I happened to taste a fruit called "Snake Fruit...!!" It exactly resembles the hood of a snake & even the scales on the fruit are dark brown & rusty & has a shiny appearance.. These scales when rubbed by hand on their opposite side hurts the skin, but the skin when carefully peeled has a dense white inside which has a good coconut like taste...!! Juz wanted to share with you about a fruit which I had never hitherto seen in India..!! I'm an italian guy, i'm vegan since I was 15 (now I'm 34), and I too write articles about fruits and vegetables! This year I started to study and write about tropical fruit... so I enjoy very much your work! 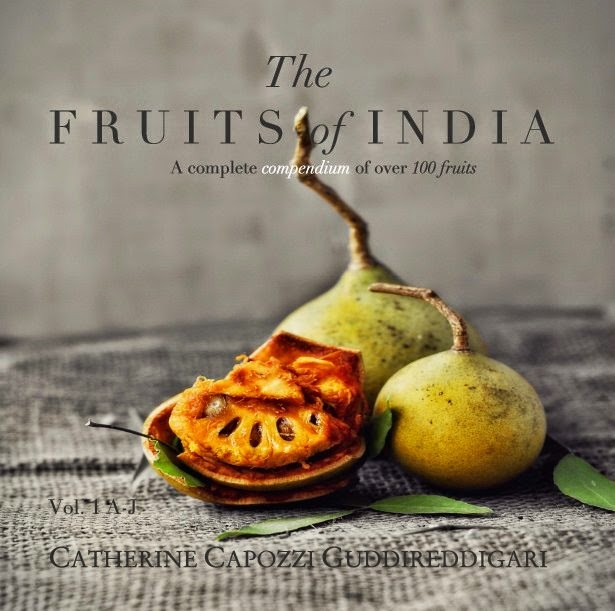 This August I'll be in Tamil Nadu for the third time, and my hope is to find and taste and describe all fruits as possible! Are you interested in a collaboration? You can contact me here: visvavarna@tiscali.it. Hi Catherine., I am from Hyderabad., Telangana, South India. nice blog. I have a small farm, wherein I grow vegetables and fruits collected from other places of India or other countries. Your book has captured fruits grown in Telangana, which I was not familiar. Thanks. Though I am new to fruit growing, I also want to grow various varieties in my farm near Maheswaram, close to the airport. I live in India but I have never seen how the water melons grow .I understand its the creeper variety . Would anyone know if the plant is deciduous or evergreen . I am from the south west on India, an area near the hills but not hilly and in monsoon climate (Middle Kerala). I have a Pulasan plant in my garden. Its 3 years now. Last year it fruited heavily, but all with no pulp or stone but an empty canal inside which might be meant for pulp and stone. Could any tell me what I can do to make it fruit normally ? Fruits are the best gift of nature. These are the tings that are healthy as well as tasty. You must have fruits in your regular diet to maintain good health. This will simply make you healthier and fit. You would also love to know about noni fruit juices or extracts to make you more healthier and fit. Hey Catherine, congratulations for this fantastic blog. Very informative. I was looking for Kair and its one of the not so known fruits of India. But you have covered it. Kudos to you. All the best. Juice Servicesfor office - Are you living in canning vale and owing a company if yes you always search for juice service provider in this area. Fruit break offer high quality and fresh juice of pine apple, mangoes, and many other fruits for offices. You can get complete detail and book you order online at our official website - Fruit Break .